Tuleta Mennonite Church, ca. 1957. 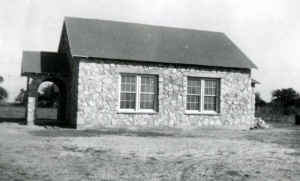 Tuleta Mennonite Church (Mennonite Church), a member of the South Central Mennonite Conference located near Tuleta, Bee County, in southern Texas, between San Antonio and Corpus Christi, was founded in 1905 by Peter Unzicker, a minister from Illinois, who acquired considerable property here and laid out the town site. A few years later other families moved in. Early ministers were J. M. R. Weaver, D. S. King, D. Y. Hooley, C. L. Ressler, and Adolph Nick 1923-1925, Daniel Kauffman and Amos S. Horst 1928-1929, and E. S. Hallman 1929-d. 1950. A severe drought in 1917 and other reasons caused most of the families to leave. The highest membership was 104, and the lowest 9, which was the membership in 1957. Hallman, Eli S. "Tuleta Mennonite Church (Tuleta, Texas, USA)." Global Anabaptist Mennonite Encyclopedia Online. 1959. Web. 18 Apr 2019. http://gameo.org/index.php?title=Tuleta_Mennonite_Church_(Tuleta,_Texas,_USA)&oldid=104789. Hallman, Eli S. (1959). Tuleta Mennonite Church (Tuleta, Texas, USA). Global Anabaptist Mennonite Encyclopedia Online. Retrieved 18 April 2019, from http://gameo.org/index.php?title=Tuleta_Mennonite_Church_(Tuleta,_Texas,_USA)&oldid=104789. Adapted by permission of Herald Press, Harrisonburg, Virginia, from Mennonite Encyclopedia, Vol. 4, p. 753. All rights reserved. This page was last modified on 6 December 2013, at 19:39.